On June 2, 2016, the Aleppo neighborhood of Nor Gyugh, predominantly populated by Armenians, came under heavy artillery attack, which left four Armenians killed. Three days later, on June 5, another Armenian was killed during severe clashes in Deir ez-Zor. Armenian-populated districts are continuously being shelled. The Armenian nursing home, the Armenian Catholic Holy Trinity Church in al-Midan quarter of Aleppo as well as other educational, civilian and historical buildings were significantly damaged in the recent attacks. Many of Syrian-Armenians are seeking help to relocate to Armenia. And it is in our ability to save their lives. 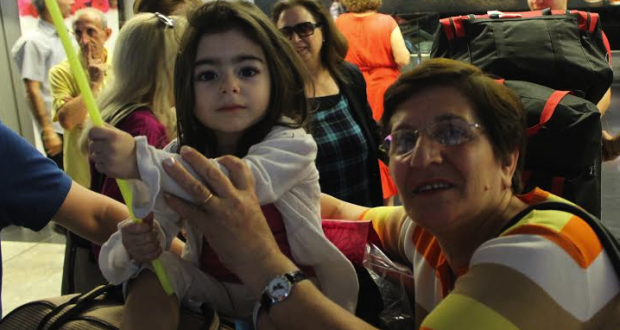 In April 2015, following the heavy bombardment of the Christian neighborhoods in Aleppo, hundreds of Syrian-Armenians requested financial assistance from the Aleppo Compatriotic Charitable Organization to assist in leaving Aleppo for Yerevan. Consequently, the Aleppo CCO launched its “Save a Life” initiative. “Save a Life” is humanitarian campaign, aimed at providing support to Syrian refugees, who escaped the war in Aleppo and moved to Lebanon, to obtain one-way ticket to travel to Armenia. Since the launch of the “Save a Life” campaign, Aleppo CCO has successfully relocated more than 251 Syrian refugees from Lebanon to Yerevan. It is worth to mention that with the great support and lifesaving efforts of the Parish Council of St. Kevork Armenian Church of Houston it became possible to purchase 130 tickets in frame of “Save a life” project. The generous donation of the Parish Council of St. Kevork Armenian Church of Houston truly made a difference in 130 Syrian-Armenians’ lives who escaped from the horrible situation in Aleppo. Currently, there are more than 600 requests registered at Aleppo CCO. People are in despair and are seeking ways to flee for a safer life in Armenia. -Flight from Beirut to Armenia. The Aleppo Compatriotic Charitable Organization (ACCO) calls on the global Armenian community and everyone who is willing to contribute to the humanitarian cause to join its life-saving mission by donating to the ‘Save a Life’ initiative to help remove Syrian-Armenians to safety in the motherland. Detailed information on people and families relocated to Armenia will be provided to each contributor and sponsor. Aleppo CCO is ready to answer to all the questions regarding the campaign. Help us to relocate Syrian Armenian families to Armenia from the conflict zone. Donate now – Save a Life!